Yep, surprise surprise, an anime with a title that has been translated as “Lesbian Bear Storm” is about love. Truly the hottest take of hot takes. But what if I were to say that it is all about arbitrary and unnatural dichotomies that human society likes to form in regards to sexuality? But not in the typical way. But the world building in this anime is non existent! Which I can understand given its surrealist, fairy tale aesthetic- but this show is actually really hard to watch unless you’re really talented at the art of suspending your disbelief! The art, novelty, and tone go along way to helping you out with that, but I don’t blame anyone who can’t sit through this anime. So- what exactly is the premise of this anime? In the past, humanoid bears coexisted with humans. However, a meteor shower that fell onto Earth had a strange effect on bears throughout the world: they suddenly became violent and hungry for human flesh, spurring an endless cycle of bloodshed in which bear ate man and man shot bear, forgetting the lively relationship they once had. The “Wall of Severance” was thus built, separating the two civilizations and keeping peace. Kureha Tsubaki and Sumika Izumino are two lovers attending Arashigaoka Academy, who, upon the arrival of two bears that have sneaked through the Wall of Severance and infiltrated the academy, find their relationship under a grave threat. The hungering yet affectionate bears, Ginko Yurishiro and Lulu Yurigasaki, seem to see the bear-hating Kureha as more than just another meal, and in getting closer to her, trigger an unraveling of secrets that Kureha may not be able to bear. To me, that sounds like Attack on Titan, but with teenage feelings of love replacing teenage feelings of societal frustration. Melodrama replacing action. But that isn’t especially the case with this anime. With the bears, they are only dangerous when they can isolate a human student, thus I expected a wolves and sheep kind of scenario. But that wasn’t especially the case either, and that is because of our protagonist Kureha. She practically leaps at any opportunity to confront the bears, and she will always leave the safety of the group to do so. It’s not safe or rational, but when we speak of rationality, is the group mentality of the humans logical? As the anime progresses, we learn that the group of humans is based on exclusion and shunning. They find common ground in their mutual hatred and fear of their common enemies. However, their enemies are not the bears alone, but whichever human stands out the most. It’s notable that despite them all being lesbian women, a sexual identity which many would think important, they still discriminate based on their differences. Almost as if groups are totally arbitrary to begin with! What I find more interesting here is that there is no inherent value to be found by remaining part of the nondescript group of humans. No sense of special pride or purpose that endears people to take part in radical groups in real life, it’s really just a basic “us vs them” mentality. 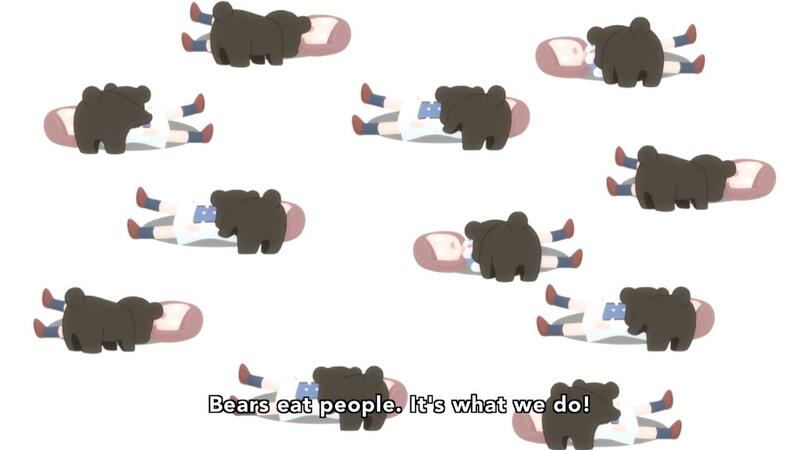 And that’s enough in the world of Yuri Kuma Arashi. It is a caricature, a pointless hierarchy, a straw man of conformity that benefits no one. But what is the meaning of this conformity? And what is the symbolism behind the lesbian bears attacking lesbian humans and killing them? Well, what behavior categorizes the humans in the show? Conformity is certainly a major part of it, but remember that my theory is that this anime is all about love. Because of their conformity, the girls lack passion. Even though they are all lesbian, none of them engage in intimate relationships with one another. Those who attempt, invariably die- save for the protagonist, who rejects her humanity. The bears are the opposite. Their relationships are passionate, intimate, sexual, and selfish. They have clear motivation, unlike the humans protecting their ill-conceived social structure. However, their desire is to often monopolize their significant other. To devour. They represent the opposite extreme to the humans. Mediocre overall, with novelty and style as its main appeal. There’s nothing unnatural with sexuality and intimacy. If your society doesn’t see the value in intimacy, then maybe it deserves to degenerate. If the ideal of your society is exclusionary, then maybe that ideal should degenerate as well. Maybe if you think that love should be a purely selfless thing, or maybe if you feel like duty should come before your own personal passions, then maybe you should become a bit more of a degenerate. Unless you are totally asexual, then you need to be able to have a give and take relationship. You have to come to terms with your own desires as well as the desires of your partner. Being purely one or the other can be disastrous or abusive without any intent of being so. And I think that’s an interesting component of relationships that media underutilizes. So yeah, flawed as it is, I’m glad that Yuri Kuma Arashi is all about love.